St. Patrick’s Day is well known and celebrated not only in the very birthplace of Irish whiskey but also all around the world and Europe. So the authentic celebration dedicated to Ireland’s patron saint may be experienced in Slovakia as well, obviously accompanied with a shot of Jameson, the best Irish whiskey. And just like every year, a special limited edition is available to go hand in hand with the celebration. Irish traditions complemented with some fun and green color being ubiquitous with a shot of premium quality Irish whiskey – that’s par for the course for St. Patrick’s Day celebration every single year with St. Patrick being the most appreciated patron saint of Irishmen. A Jameson limited edition has been a natural part of the celebration and this year is no different either. The fans of this Irish whiskey in Slovakia are welcome to make St. Patrick’s Day (just like every ordinary day) as memorable and pleasant as possible with the new limited edition. John Jameson & Son has been launching the impressive Jameson bottles dedicated to the most prominent patron saint of Irishmen since 2012. The legendary design has been the brainchild of select renowned artists for 5 years in a row with a clear intention to showcase Irish history and roots of this legendary spirit as distinctly as possible with the design. This year Steve McCarthy, a Dublin artist has embarked on the mission to design the bottle. The Jameson limited edition sports a label telling the story of two alienated clans in the 15th century Ireland competing against each other and eventually burying the hatchet with shaking hands on the peace treaty. Two joined palms also serve as a symbol for Dublin being a welcoming and open city. 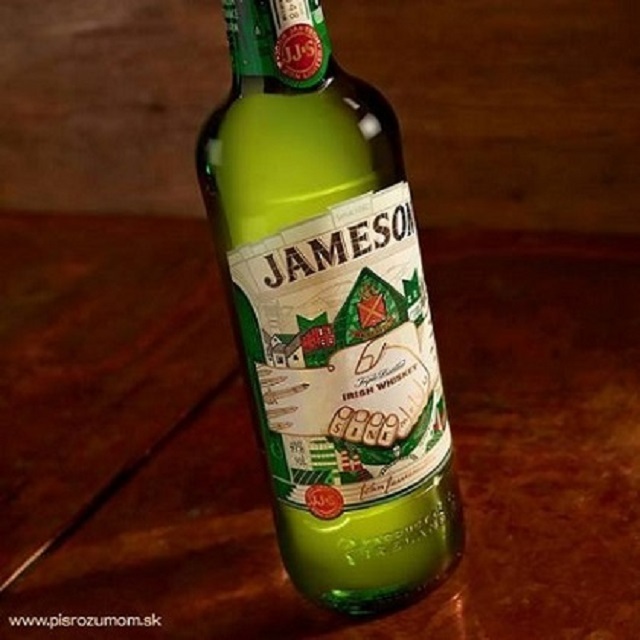 The traditional message of the brand “Sine metu” (“No fear” in translation) being the family motto of the founder of Jameson can also be spotted on the bottle. The limited edition is available only for a couple of days every year in select countries and it definitely should be a part of every quality Irish whiskey collection. Organizing an authentic Irish party and tasting the exceptional Jameson limited edition has never been easier for Slovak fans wherever they are – whether in a pub or at home.